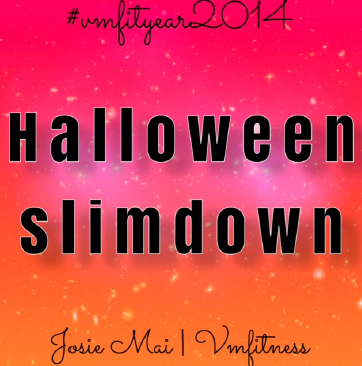 VMfitness: #Vmfityear14 October Month Workout Plan: HALLOWEEN SLIMDOWN! #Vmfityear14 October Month Workout Plan: HALLOWEEN SLIMDOWN! HELLO OCTOBER! Oh my goodness the months are flying by! How are YOU doing so far this year? Getting to your goals? Working hard? Or maybe not so hard? Well it's time to CHANGE that. Change for YOU. Do you have a goal that you envision yourself in? Why not put in the work to GET there! You have all the tools you need to get to where you want to be, you just need some self motivation to push yourself to get there. Remember, you only get the results from the work you put INTO yourself. Get ready for some HIGH INTENSITY workouts right here, full of jumping actions mixed with some light weights, to get that heart rate going and that fat BLASTING. If you cannot perform some moves, like a burpee or mountain climbers, I have added a slight modification in there, but if you cannot do them AT ALL due to physical limitations, then this might not be the plan for you! But you can always try any of the other #Vmfityear14 Month Workouts to focus on building strength in the gym to jump start your journey! So what are you waiting for?! You've got 1 month til the big Spooky Holiday, so grab your program, some light weights, and get to work! You'll be addicted to the sweat and the change you'll see. The post you shared here was really interesting and I really enjoyed reading it. I also want to learn and do yoga but I do not want to go out for it. Can you share here a basic yoga video for me please?